Its major export partners are Germany, Slovakia, and Poland. Its main exports are machinery and transport equipment, raw materials, and fuel. Its major import partners are Germany, China, and Poland. Its major imports include machinery and transport equipment, raw materials, and chemicals. Located in Central Europe, Czech Republic has a 2,143.00 km border with Austria (402 km), Germany (704 km), Poland (796 km) and Slovakia (241 km). Prague is the capital and largest city of the Czech Republic, situated in the northwest region of the country on the Vltava River. As of 2017, the city held a population of 1,280,508 while the larger metropolitan areas had 2,156,097 residents. Prague is the fifth most visited city in Europe after London, Paris, Rome and Istanbul. Prague boasts of having one of the world’s most pristine collections of architecture. The climate of the city lies between humid continental climate and oceanic climate. Czech Republic is a European country covering 78,867.00 km2 of which 2.05% is water and 77,247.00 km2 is land. This makes it the 114th largest country in the world and about two-thirds the size of Pennsylvania; slightly smaller than South Carolina. Its geographic coordinates are 49 45 N, 15 30 E and Prague is the capital city. The name Czechia derives from the Czechs, a West Slavic tribe. Its ISO code is CZ. Czech Republic has a mean elevation of 433 m above sea level. It has a temperate climate with cool summers and cold, cloudy winters. Its terrain is made up of rolling plains, hills, and plateaus surrounded by low mountains. Czech Republic has a population of 10,644,842 making it the 86th largest in the world. The population is distributed evenly throughout the country. Czech is the official language. The major ethnic group is Czech, followed by Moravian and Slovak. The majority of the population is non-religious. The Czech language is the official language of the Czech Republic. Together with Slovak, it is from the West Slavic branch of the Slavic languages. In fact, the two are so closely related that they are considered mutually intelligible. It goes back to the 10th Century. Within the country, there are 14 dialects of the language. It is based on the Latin alphabet and has 42 letters. It is spoken by 96% of the population. It is among the most difficult languages to learn and speak as a foreigner. The country officially recognizes 14 minorities thus bestowing upon them the right to not only address authorities in their respective languages but to also the right to have their children taught in these languages as well. The dialing code for the country is 420. Czech Republic is an independent country. It became independent in 1993, when Czechoslovakia split into the Czech Republic and Slovakia. Its constitution was last ratified in 1992. The government of the Czech Republic is a parliamentary republic with the president being the head of state and the prime minister the head of government. The government structure of the Czech Republic has been as it was since 1992 when the constitution was adopted. The structure was set in place after Czechoslovakia was dissolved and Czechia and Slovakia becoming two different nations. The current president of the country is Milos Zeman, the head of the PCR (Party of Civil Rights). The current Czech Republic prime minister is Mr. Bohuslav Sobotka who is a member of the social democratic party. The 3rd president of the country has been in power since March 8, 2013. The parliament building is situated in Prague. The authorized residence of the president is the Prague castle. The official home of the prime minister is the Kramais villa which is located in Hradcany district. The elections are held after every five years, and the president can only serve for only two successive terms. The president usually appoints the prime minister of the Czech Republic. Factoring in Purchasing Power Parity, Czech Republic's GDP is $351,000,000,000.00 (USD) with $33,200.00 (USD) per capita. This makes it the 50th largest economy and its citizens the 54th richest in the world. The currency of Czech Republic is the Koruna (CZK). Its major export partners are Germany, Slovakia, and Poland. Its main exports are machinery and transport equipment, raw materials, and fuel. Its major import partners are Germany, China, and Poland. Its major imports include machinery and transport equipment, raw materials, and chemicals. The flag of the Czech Republic has two broad white and blue stripes, plus a blue wedge on the left side of the flag. This flag was the official flag of the former Czechoslovakia, which they adopted after the dissolution of Czechoslovakia. This flag was adopted in 1993. The white and red colors are the original heraldic bohemian colors. 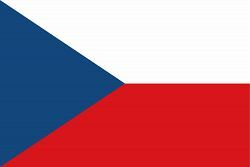 In order to differentiate Czech flag from the flag of Poland, the country also added a blue wedge. The red color of the flag symbolizes strength and courage while the blue color on the wedge symbolizes loyalty and truth. The white color on the flag symbolizes peace. This flag was designed by Jaroslav Kursa, an activist, in 1918 after the country gained its independence. This design was formally accepted in Czechoslovakia national assembly on March 20, 1920. Czechoslovakia was part of the kingdom of Bohemia, and they used they Bohemian flag which was white and red.